Get a sophisticated look of custom tailored shades at an affordable price. 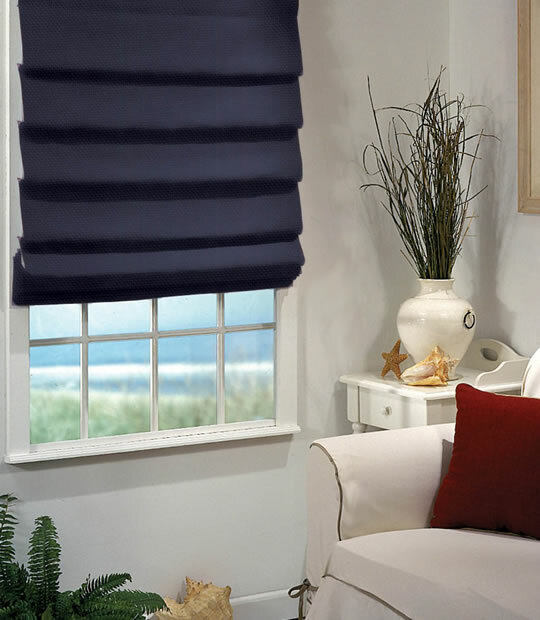 These shades feature high quality fabrics that come in a Hobbled style for that luxurious look, with an assortment of neutral tones and fashionable patterns. The soft flow of this style is created by hobbling the face fabric onto the lining at regular intervals. This creates cascading soft folds at 6" intervals. These hand-crafted roman shades are elegant window coverings that offer both light diffusion and enhanced privacy for your home. While still tailored, this style has a wonderfully soft feel. The flexibility of this style lends itself to use with all kinds of fabrics from more heavy, full-bodied to softer, more lightweight. Note: when using a pattern with a large repeat, the pattern will be interrupted at each pleat/fold. All our shades come with a standard liner. Pleat size 6-1/4". Bottom pleat varies 1-1/2" to 7-5/8"